TrackDays.co.uk has secured new driving experiences at Rockingham for its customers meaning even greater choices when booking driving experiences. TrackDays.co.uk has secured new driving experiences at Rockingham for its customers meaning even greater choices when booking driving experiences. Rockingham is a well known Motorsport circuit with a fabulous Motorsport heritage and is a perfect venue for fantastic super car driving experiences. With tight chicanes and straights its a perfect test of drivers skill partnered with some of the most exotic and powerful supercars available. 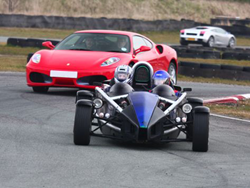 A true Motorsport enthusiast experience that's bound to push driving skills to the limits in the luxury of a super car. It’s a real playground for the experienced driver.